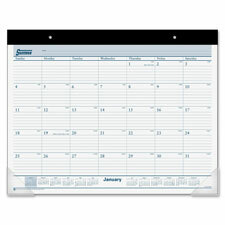 Combine a monthly desk pad with an appointment book and you get this smart planning tool. 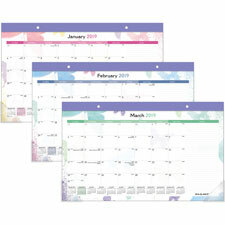 Desk pad features a monthly grid of appointment times for each day for more detailed planning. The one-page-per-month format offers hourly appointment times from 7 AM to 6 PM in ruled daily blocks (2-3/4" x 2-1/2"), count of days/days remaining, Sunday-through-Saturday scheduling, holidays, and a full-year calendar reference. The current reference month is printed in red for quick identification. Dated planning pages range 12 months from January to December. 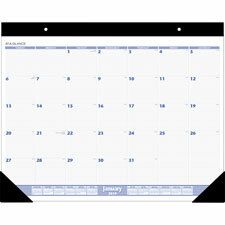 Perforated pages easily tear out of the paper headband that binds the calendar pages at the top. Clear poly corners secure the pages at the bottom. Headband also offers two eyelets for easy hanging. Pages are printed on quality paper made with recycled post-consumer material. 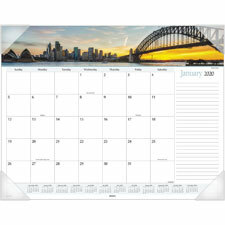 Classic styling of this monthly desk pad calendar is a good choice for a professional appearance. Take notes, make appointments and track monthly goals on the one-page-per-month format. Dated planning pages range 12 months from January to December. Each page includes ruled daily blocks (2-7/8" x 2-3/8"), Sunday-through-Saturday scheduling, count of days/days remaining, holidays and a full-year calendar reference at the bottom. Nonrefillable desk pad also features a black headband, poly corners and two eyelets for hanging. Pages are printed in black ink on white paper. Efficiently open your letters with this eco-friendly antimicrobial letter opener with corrosion resistant, precision ground stainless steel blade. Its comfortable contoured handle contains post-consumer recycled material. Packaged in a recycled card that contains post-consumer material. 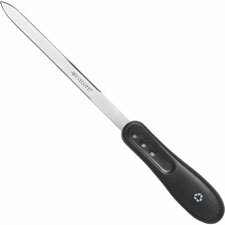 Letter opener provides built-in antimicrobial product protection against stain-causing and odor-causing bacteria.